A common source of confusion and head scratching, there are multiple ways to spell our beloved treat: donut vs. doughnut. This leads us into the eternal debate, which do you use and when?? Donut: The classic, laid back, non-assuming, humble friend. Generally speaking, cheap and no-frills. Fried and more often than not served in a nondescript white bag or pink box. Your best friend who knows all your secrets and would never tell a soul. Tried and true. Doughnut: The fancy, rich dough cousin with the latest iPhone and over a thousand Instagram followers. Funky, innovative flavors. Maybe baked or something else insane like gluten-free (God forbid). Slightly bougie but likable. The cool kid in high school everyone wants to be friends with. What are your thoughts?? Comment below! Here they break down the 7 types of American Doughnuts and where to get them. An ode to the yeast, cake, jelly, cream, old-fashioned, cruller, and long John. Enjoy! Sure, working for the VA Boston Healthcare System is great because we get the opportunity to serve the veterans that served our country. What is also great about working here is having co-workers down for some dough. 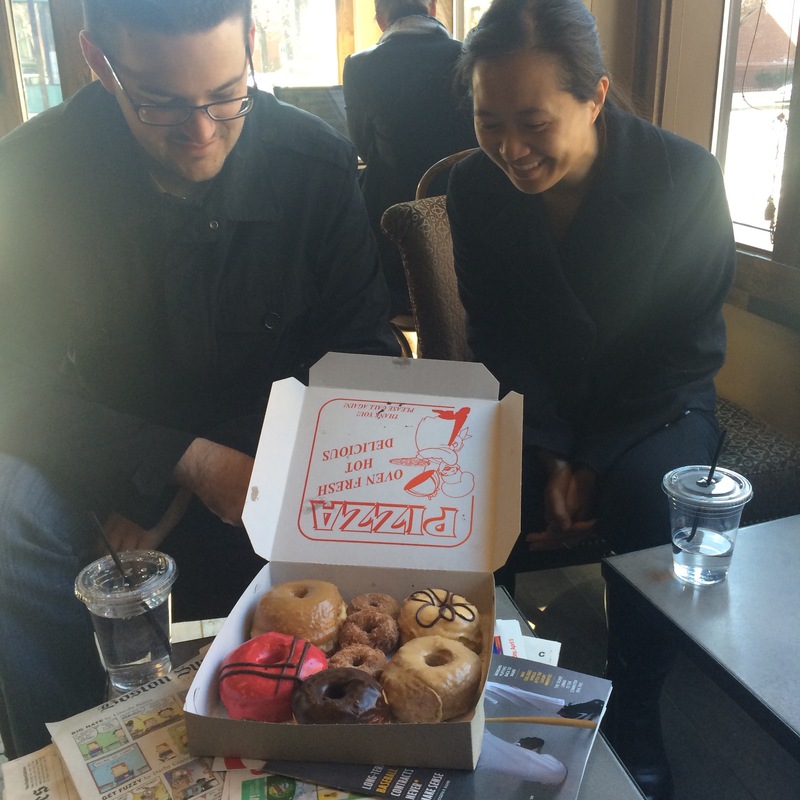 It all started a few months ago when I brought in a dozen from Twin DO-Nuts in Allston, MA. This isn’t exactly on my way to work, but since when does that matter when chasing doughnuts. Twin is everything I love about a small family owned donut shop. It’s no corporate, mundane chain **cough, Dunkin, cough** and as you can see from the storefront is has it’s own unique character. 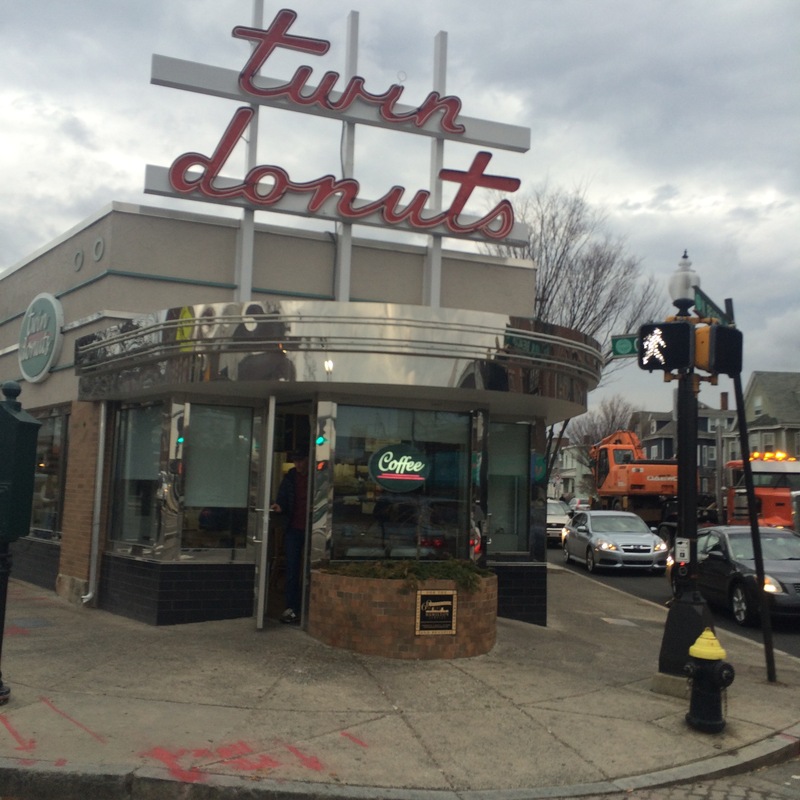 The sign is as iconic in Allston as Randy’s huge donut is in LA (see Hole in the Sky). And obviously the donuts are freaking great. 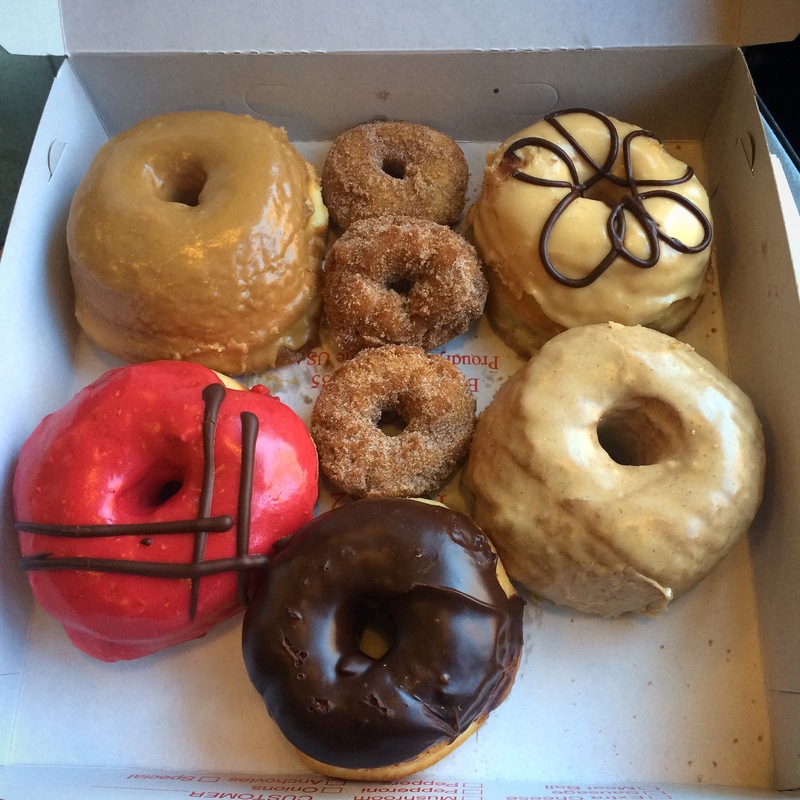 Classic flavors: glazed, chocolate glazed, chocolate frosted, lemon, jelly, powered, sugar raised, old fashioned. Can’t ever go wrong with the fluffy yeast donuts and traditional cake pairings. 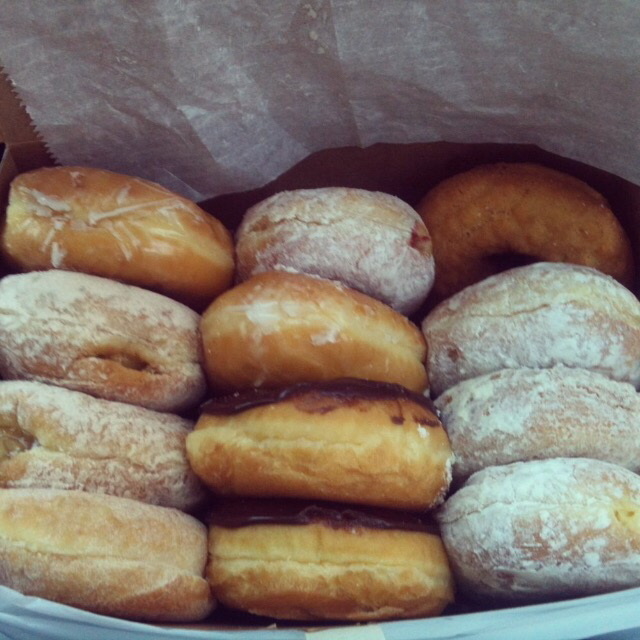 And for $8 for a dozen, it’s hard not to make everyday a donut day. 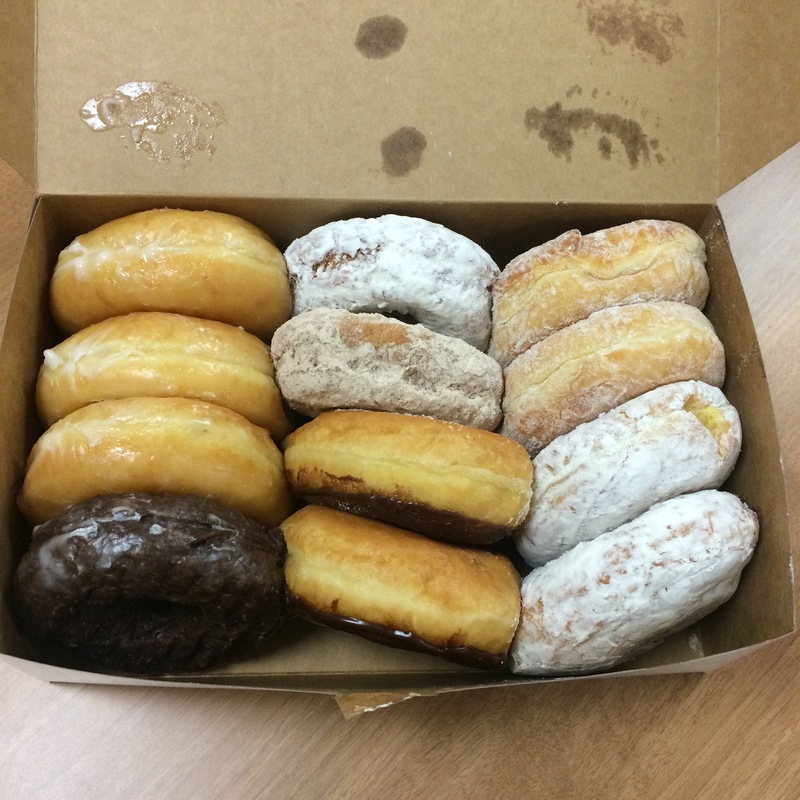 Since this first introduction, a weekly tradition has begun and Donut Tuesdays/Wednesdays/Thursdays have emerged thanks to generous contributions from some awesome co-workers. 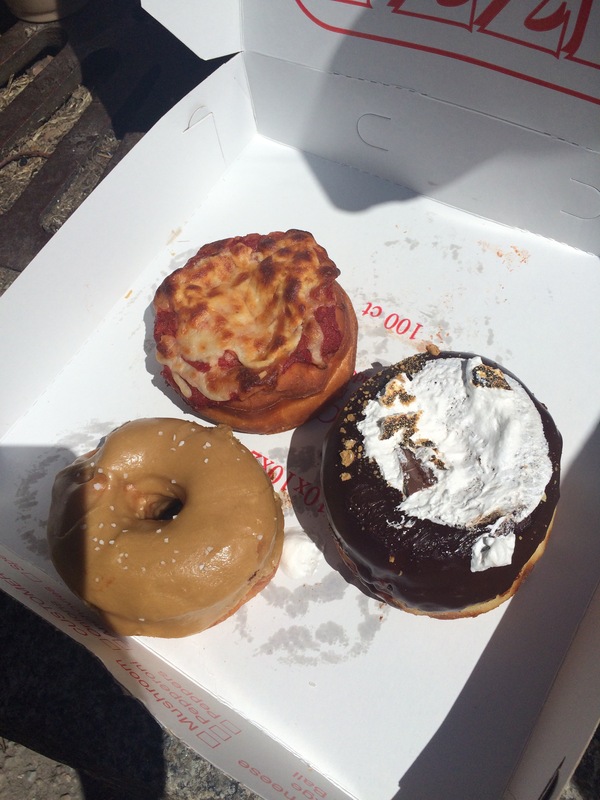 Thanks to this movement, we have also sampled masterpieces from the lots of Blackbird Doughnuts in the South End, Mike’s Donuts in Mission Hill, and Doughboy Donuts & Deli in Southie. And of course this is New England, so it’s impossible to get away without having a few Dunkins as well. So this proves that it’s not just me; these guys are also suckers for donuts any day of the week. Apple Cider Fritter from Blue Star Donuts in Portland, OR. Why: They are made from leftover holes throughout the day so it pulls apart like magic. Why: Nutella filled. End of story. Why: Made with roasted coffee beans and topped with pecan brown sugar. Why: Peanut butter, bacon, bananas, and a honey drizzle. Why: Zesty orange with semisweet chocolate. Why: All of the ingredients are incorporated into the dough preparation. Why: Crispy on the outside and soft in the inside. Personal side note: Get one filled with guava and topped with li hing. I dream about the day I get to have another one of these little guys again. Why: Homemade cookies and cream filling. Why: No-frills perfection with the right amount of crunchy. Why: Vegan and gluten-free options (if you’re into that sort of thing). Why: Coconut cream topped with chocolate ganache and toasted coconut. Owned 100% by police officers! Why: Fresh, in-season produce handpicked that morning with homemade glaze. Personal side note: strawberry season is early summer, peach in late summer. Why: Berry goat cheese filling topped with lavender icing. Why: Crispy crunchy hazelnut crumble. Personal side note: You can also get these donuts at the SOWA market in Boston’s South End late spring to early fall, but go early because they will sell out. Why: Maple icing, crispy bacon then coming right back for more icing. Why: Perfect balance of soft and crunchy… and you can get one through the drive-thru. Why: Everything is bigger in Texas. Why: In the breakfast battle of donut vs toast for your breakfast side, donut always wins. Why: Caramel icing perfectly coated with cinnamon sugar. Why: Mini donuts traveling around in a food truck. Why: They boast a secret ingredient that can’t be found in chain shops and they can be ordered in the size of a cake. Why: Seasonal surprises including caramel apple and s’mores. Why: Local and handmade since the 1950s. Why: Fried chicken with a side choice of naked, seasoned, or glazed. Why: House-made nut and berry granola, greek yogurt, drizzled with honey. Why: Nutty notes to counterbalance this sweet classic icing. Personal side note: FAVORITE. MUST HAVE. Why: Marshmallow, chocolate fudge icing topped with fudge candy. Why: BEER cake donut topped with bacon and a buttery crumble. Why: You can finally get away with having ice cream for breakfast. Why: Sugar and spice and everything nice in Sin City. Why: Did you not see that “Fresh Donuts Now” sign?? Hello nostalgia.